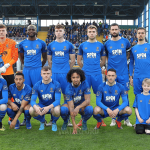 Derek Daly scored a priceless 50th minute goal that was good enough to give Waterford FC their second league win on the road this season in the SSE Airtricity League First Division. A spirited performance from local rivals Wexford at Ferrycarrig wasn’t enough as the Blues secured a narrow 1-0 victory. With an un-changed side named for the first time this season following last week’s win over Shelbourne at the RSC, the Blues were hoping to take control of the tie early in the game however the opening stages became very disjointed with a series of free-kicks awarded by the referee Tom Dempsey. The first chance of the game finally came on 20 minutes with Blues defender Patrick McClean striking his own post with a header after a long throw from the left side by Wexford skipper Craig McCabe. The home side went close again seven minutes later when the Blues were caught in possession. Ricky Fox picked up the ball on the edge the penalty area but his shot flashed across the face of Matthew Connor’s goal. After a lacklustre start, it took the Blues up to the 31st minute to create their first chance of note when Mark O’Sullivan got on the end of a Garry Comerford cross from the left at the near post but his first-time shot was saved by Wexford keeper Corey Chambers. Match winner Derek Daly could have put his side in front with two minutes remaining in the first half when he got on the end of a Comerford delivery but his effort was wide of the far post before the Blues were dealt a massive blow at half time when striker Mark O’Sullivan was forced off with an ankle injury. 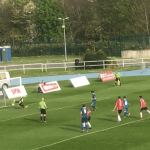 It was Conor Whittle who came on in his place and the Waterford native played a crucial part in the breakthrough goal five minutes into the second half when he set up Derek Daly who hit a crisp left-footed finish from the edge of the penalty area. Mark Slater did have the ball in the back of the Waterford net on 64 minutes when he cut into the penalty area past a couple of tackles but the flag of assistant referee Mark Moynihan was raised as the ball had crossed the endline. Danny Doyle controlled a ball superbly on the left-side of the penalty area four minutes later but the attacker couldn’t direct his shot on target as his effort from 20-yards sailed over the crossbar of Waterford netminder Matthew Connor. 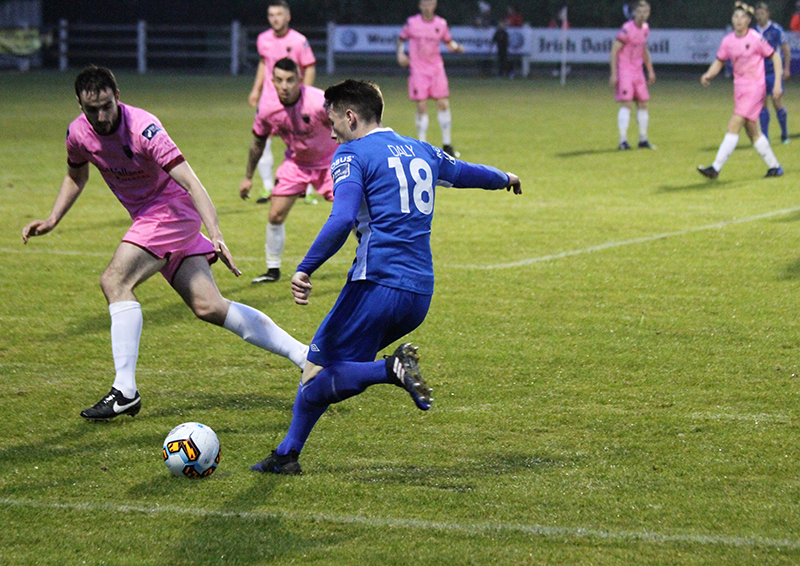 Despite having to survive a late penalty call for handball and having to defend a couple of corner kicks, the Blues held out for a massive three points in their bid for promotion to the Premier division and it’s a confident boost ahead of a big game against Longford Town at the RSC on Friday night next.